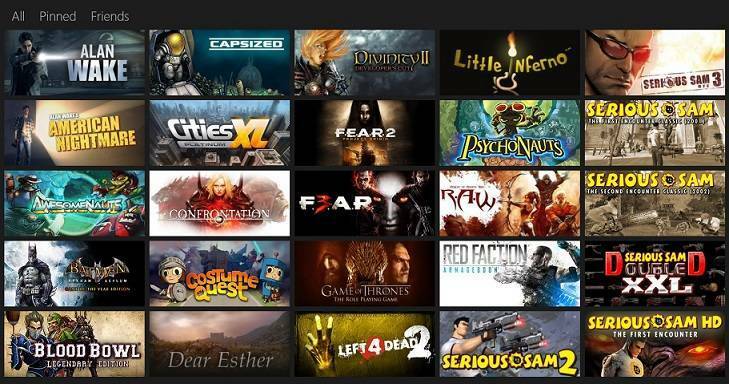 In the past, we have shared with you the Steam Tiles app for Windows 8 users that allowed you to pin Steam games to the start screen of your Windows 8 tablet. Now, another similar Steam app for Windows 8 app has caught our attention, called simply Pin Steam. Just like the Steam Tile app that we have covered, this too lets you pin your Steam games or friends to the Start Menu with good looking tiles. UNLIMITED FREE TRIAL! Live tiles show you which of your friends are playing which games. You can also pin friends directly to the start screen and follow their online status. To use Live Tiles, this app requires you to have a Steam account and to have setup a Custom URL in your steam profile. It also requires Steam to be installed on your device to launch games. (NOTE: Steam is not available for Windows RT yet!) Neither this app or it’s creator is affiliated with Valve Software in any way. This app has an unlimited trial! You can do everything except actually launching the game from the Start Menu. Since the app comes with full Windows 8.1 support, you can change the live tiles to support any tile size – large, wide, medium or small. The app has been recently updated with a new user interface and a lot of bug fixes. This Windows 8 Steam app is really, really fast and this is probably the reason why so many have given it a good rating. What’s really cool about the app is that it comes with an “unlimited free trial”, which means you can use the app for as long as you want, with no ads at all. If you want to support the developer, the app costs $1.49. The looks really, really gorgeous and fetches your games collection instantly. Follow the link from below to download it from the Windows Store and start enjoying your Steam games!